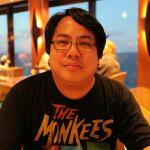 MPAA Rating: PG-13 for sequences of violence and action, and some suggestive content. No post-credits scenes. Running time: 141 minutes. 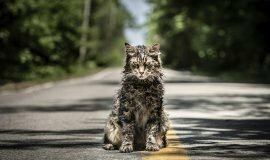 Released by Warner Bros. Pictures. Welcome to Diana Prince/Wonder Woman’s formal introduction into the DC Comics Extended Universe. Gal Gadot may have played her in last year’s Batman v Superman: Dawn of Justice, but this explosive and challenging film is the arrival Diana Prince deserves. 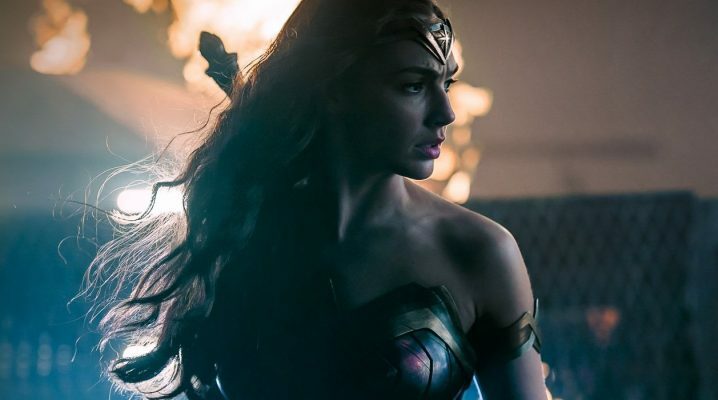 Wonder Woman turns Gadot into the primary special effect in a film designed to make her the fierce, bold, and inspiring standout which her character needs to be. The first thing to note about Wonder Woman is that she is never referred to as “Wonder Woman” by any character in the way the names “Batman” or “Superman” get thrown around. That she is a warrior is enough; her peers call her Diana, treating her as an equal – and in many ways, a superior – when the social rules of the 1910s stated otherwise. She is smart, educated, and formidable, with Gadot making her believable and energetic, earning the film and character title in more ways than one. 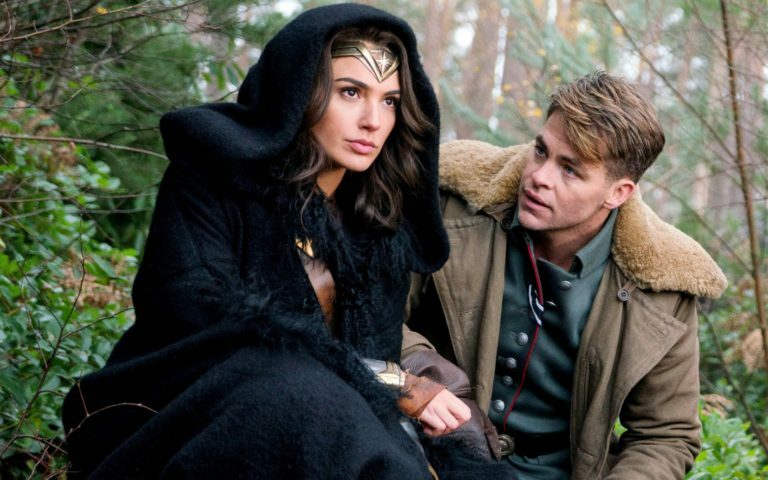 We enter her story after her home island of Themyscira is unwillingly dragged into World War I by escaping American spy Steve Trevor (Chris Pine), who unwittingly crash-lands on its shore with a German detachment on his heels. After seeing how humans use their rifles to kill from afar, and hearing Steve’s stories of the War and the resulting wanton death of innocents, Diana – interpreting Steve’s hyperbolic description “war to end all wars” as a sign of disgraced god Ares’ return – leaves Themyscira with him to finish the war and put an end to Ares once and for all. It’s what she and her race of Amazon women have been training for their entire lives; how is hiding on their island going to help anything? When she reaches early 20th century London, pointed observations are made upon the utter stupidity and pointlessness of how humans fight wars, especially regarding the innocent caught in the middle. Having been raised and trained by warrior women, Diana is a true professional who is absolutely mortified that a military general sits in a comfortable room instead of fighting with his soldiers on a battlefield; she is enraged upon the sight of a displaced woman and her child cowering in the trenches of No Man’s Land; and she can’t understand why Steve stops her from killing General Ludendorff (Danny Huston), the architect of Germany’s rising chemical weapons division, if it means an end to the war. All of this makes her wonder if her mother’s (Connie Nielsen) parting words – “They do not deserve you” – were more right than Diana wants to admit. The rest of the film – its casting, characterizations, screenplay, score, color palette, and photography – has been dialed back to direct our focus onto Diana as we witness the horrors of World War I through her eyes. Rupert Gregson-Williams’ music copies the vibe of “Time” from Hans Zimmer’s Inception score almost beat-for-beat, with no particular theme to the proceedings except for the guitar-driven hook heard in Wonder Woman’s trailers. 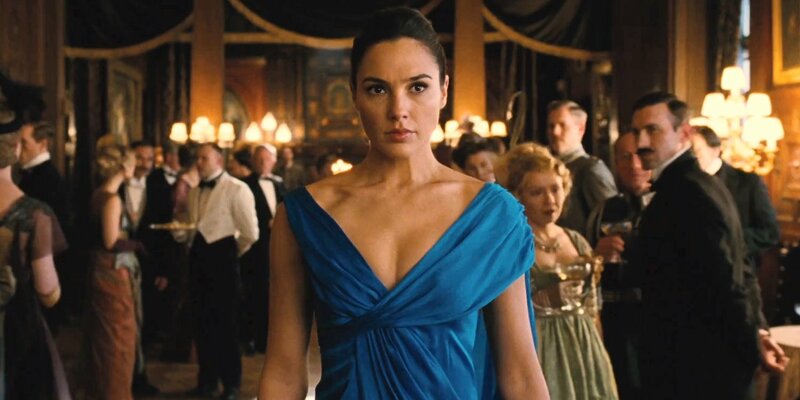 Diana is given the most colorful outfits in a film where the palette runs from gray to gray-blue (rich wood tones denoting wealth excepted); her armor and a particular dress she wears toward the film’s third act pop off the screen and demand our attention. Her outfits also serve to further cement and define her womanhood in a male-dominated society at a precarious tipping point of human history. After Diana leaves Themyscira, she is one of three female characters seen in the outside world – the other two being a harried secretary (Lucy Davis) and a mad scientist (Elena Anaya) whose face is half-obscured by what looks like mask straight out of Georges Franju’s Eyes Without a Face. Of course, the film’s first act, located entirely in Themyscira, gives us plenty of Diana’s definition, aided by her mother, Queen Hippolyta, and Hippolyta’s military general and sister Antiope (Robin Wright). We see how Diana is shaped from coddled child to an unstoppable warrior (with hints of a mysterious power). 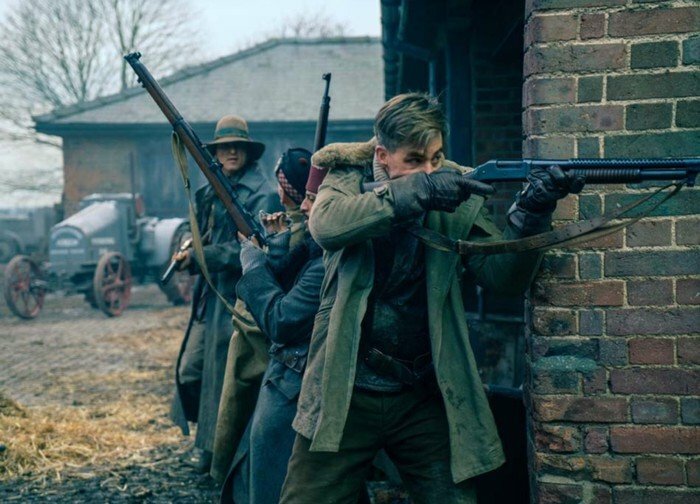 Alternatively, the male roles are interchangeable and ill-defined, with Steve Trevor being little more than a military mook in a collection of mooks. Although acted well by Pine, this character – with whom Diana is supposed to fall in love – is nothing more than a hodgepodge of different character traits. He’s strong, but meekly toes the line when the decorum of war insists he must; we know nothing of his background, except that he’s on loan to the British from the US military; and he has a gentle soul which is often at odds with the circumstances in which he has to work. The other members of their team – a sniper who can’t snipe (Ewen Bremner), a displaced Indian who’s there to make money off both sides (Eugene Brave Rock), and the team’s language and disguise chameleon (Saïd Taghmaoui) – are given attempts at humanization, but only just. We’re told the barest minimum of their stories before they’re made to carry out whatever task they’re assigned; even then, they kind of fold into a marginalized base unit who are there as Diana’s support. It’s almost as if screenwriter Allan Heinberg didn’t know what to do with them once they popped up in the story… but that’s part of the satire, whether intentional or not. 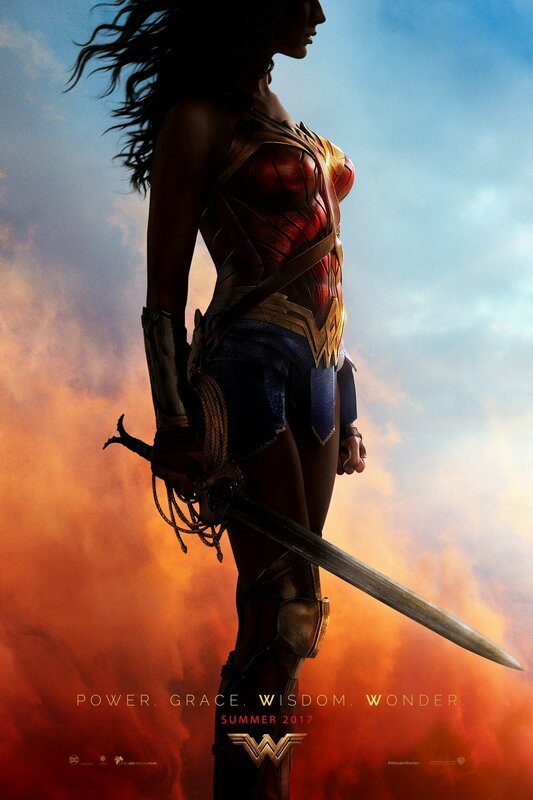 All too often, we get war films where men send countless scores to their deaths and chalk it up to “War is Hell.” With Wonder Woman, we have someone willing to cut to the quick and stop the fighting at its root (because she’s that much of a badass and is more than capable of doing so), but she’s still saddled with the unnecessary baggage regarding the “civility” of war. The satire may not be as on-the-nose as last year’s female-fronted Ghostbusters remake, as Wonder Woman is more of a dramatic piece than jokey, but it’s hard not to see when males are relegated to the female roles to varying degrees of success. Wonder Woman may be the first serious attempt (outside of Joss Whedon’s “Buffy the Vampire Slayer” series) to portray females taking the power and running with it, not having to first spend time vying for equal footing with male superheroes. Although she was secondary in the aforementioned Batman v Superman: Dawn of Justice, we can finally watch her grow and become every bit of the Amazonian demigoddess she’s destined to be. And you know what? 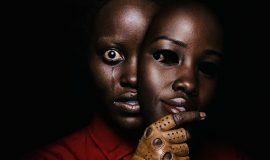 It’s the movie both she and we deserve.